Angel falls is estimated to be 15 times as high as America's Niagara Falls. Angel Falls or Salto Ángel (indigenous name: Kerepakupay Vená) is the world's highest free-falling waterfall at 3,212 feet with an uninterrupted drop of 2,648 feet lying in the Canaima National Park, Venezuela. It is situated on the Churún River, an affluent of the Carrao. Curún in indigenous Pemón language means "thunder." Angel Falls is located in the Guayana highlands, one of the five topographical regions of Venezuela. 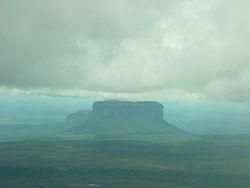 It plunges off the edge of a tepui, or table-top mountain, called Auyan Tepui (“Devils Mountain”). It is 500 feet wide at its base and in total is 15 times higher than America's Niagara Falls. Angel Falls is one of Venezuela's top tourist attractions, despite its remoteness and the absence of roads leading to nearby villages. One of the world's great natural wonders, Angel Falls inspires feelings of awe in the hearts of those who make the journey. Although sighted in the early twentieth century by the explorer Ernesto Sanchez La Cruz, the waterfall was not known to the Western world until it was visited in 1935 by the American aviator, James Crawford Angel, on a flight while searching for a valuable ore bed. In 1936, he returned and landed his plane at the top of the waterfall. The falls are currently named "Angel Falls" after him; interestingly, the indigenous name for the falls means "Devil's Mouth." Angel's monoplane settled down into the marshy ground atop Auyan Tepui and remained there for 33 years before being lifted out by a helicopter. Jimmy Angel and his three companions managed to descend the mountain and make their way back to civilization in 11 days. 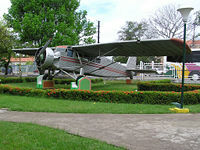 Angel's plane currently sits in the Aviation Museum in Maracay, Venezuela. A similar plane visible at the top of the falls is a replica. The official height of the falls was determined by a National Geographic Society survey in 1949. Canaima National Park, in which the Falls are located, was designated a UNESCO World Heritage Site in 1994. Angel Falls seen from Raton. Angel Falls is situated in the Gran Sabana region of Venezuela. The periphery of this area is filled with grasslands, whereas deeper into the Gran Sabana one finds dense jungle. This part of the world is remarkable for its numerous tepuis, flat-topped mountains with vertical walls. Angel Falls is located on the side of an extremely large and high tepui known as Auyan Tepui. Tourists sometimes refer to the stretch of the Churún River where the falls are located as the Auyan Tepui River, but the river that culminates in the drop is the Kerepakupai-merú. In the indigenous Pemón language Kerepakupai-merú means "waterfall of the deepest place." There is an incredible variety of tropical wildlife in the area, including monkeys, poison arrow frogs, and hundreds of species of orchids. Aside from the monkeys, mammals in the area are generally difficult to spot but include giant anteaters, armadillos, porcupines, three-toed sloths, otters, jaguars, pumas, tapirs, and capybaras. One of the several impressive tepuis, or table-top mountains, in Canaima National Park. Lying within the Canaima National Park, Angel Falls is part of the plateau that underlies the lands located in Venezuela to the south of the Orinoco River. The plateau's age is estimated at two billion years. Important geological transformations can be seen at the park, from its beginnings in the Precambrian period dating back to the time of the formation of the supercontinent Pangaea. This continent began to separate due to the formation of a fracture in the planet's crust resulting in the formation of the Atlantic Ocean, and the creation of different portions of lands called shields. The geographic region in Venezuela, known as the Guyanese Shield, existed from the start as a great plain at an elevation roughly as high as today's visible tepuis, about 6500 to 9800 feet. After the formation of the great plain, during a long period of time—approximately 400 to 200 million years ago—a series of climate-related phenomena caused important changes in the geography of the Guyanese Shield. The transformation of the landscape was due to drastic variations of arid climate to humid and vice versa; of strong, constant and lingering precipitations; droughts, freezing, discharges with high and low temperatures; storms, hurricanes, and the tectonic movements of the earth. The erosion was caused by atmospheric agents removing the material deposited in the great plain during millions of years. In places where the rock was less resistant, the erosion was greater resulting in this great transformation, the Tepuis, and the fantastic scenery at the Falls. The climate at Angel Falls is tropical, with frequent rainstorms. The driest time of year—when the Falls may be just a trickle—is from December to April. A trip to the Falls is not a simple affair. An air flight is required, as there are no access roads. Trips to the Falls are sold in a package. It is also possible to purchase a package that includes an aerial flyby of the Falls. The Falls cannot be seen on cloudy days, and there is no guarantee a visitor will see them. During the dry season (December to March) there is less water than what is seen in some photos, but it also more likely that the top will not be clouded. The entire trip usually takes 24 hours. The pool of water that collects beneath Angel Falls makes for a refreshing swim. It is possible to charter a plane to Canaima, and then make local arrangements to get to the falls. Many prefer to sign up for a tour that takes care of the details. The most cost-effective tours are booked from Ciudad Bolivar. Prices include the cost of a plane that flies from Ciudad Bolivar to Canaima. A three-day tour that brings you to the falls is reasonably priced; a flight that takes you right over the falls is slightly more expensive. A typical tour will include the flight to Canaima, and then three days of meals and rustic accommodations at the various campsites along the river towards the falls. Boat rides along with sections of hiking are required to get to the campsites, but the rivers are sometimes not navigable during the dry season. Tour guides typically speak Spanish and English. 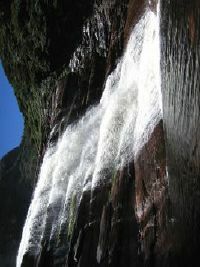 Angel Falls lies deep within the National Park. When first entering the park at the airport in Canaima) one must pay the park entrance fee. Trips up to the Falls will usually be in a dugout canoe. The boat rides and walks through the jungle offer a unique view of Venezuelan flora, fauna, and terrain. If the water flow is mild enough, one can swim in the small pool that forms below the falls. The 30-minute walk from the closest point on the river to the base of the Falls is not easy going because of large tree roots on the path, and visitors are advised to wear sports shoes for this hike. Camping is not allowed. This page was last modified on 21 March 2016, at 15:11.